What’s in a San Marcos 2016-17 budget? Being in the landlord business has paid off for the city of San Marcos. Being in the civic landlord business apparently has been good business for the city of San Marcos. The city’s newly adopted 109-page, $69.3 million General Fund budget for Fiscal Year 2016-17 featured 12 percent of all revenue coming from leasing City Hall office space and Creekside Marketplace to business like Hobby Lobby and WinCo. A new DMV office also is paying the freight while a challenge exists in finding new tenants for City Hall office space following the sudden bankruptcy and exit of US Colleges, San Marcos officials said. “This diverse revenue base has enabled the city to weather the recession storm, maintain service levels and invest in long-term rehabilitation,” San Marcos city manager Jack Griffin said in a 12-page letter sent to city council members ins support of the budget that passed June 14. The city also will begin the new fiscal year “liquid reserve level” of nearly $30 million, according to the city manager.“The city’s financial outlook remains quite strong,” Griffin said. That’s about 42 percent of the General Fund budget, and will be spent as needed through the fiscal year. City officials projected a 3.6 percent growth in general funds compared to the 2015-16 budget. Personnel expenses took up nearly half of the general fund budget for the fiscal year that runs from July to June 2-17. Salaries and wages were set at just over $22.2 million. Health benefits were around $3 million. Retirement benefits were around $6.2 million with other costs pegged at almost $1.4 million. The city manager earns a maximum of $253,693 annually, not including benefits, according to a citywide compensation schedule available here. The city clerk earns a maximum of $144,328 while city council members earn a maximum of $11,732. among around 110 city positions listed, the lowest earnings appeared to be a maximum of $52,644 for recreation workers and office specialists. San Marcos budget approved. To read the full budget click here. — Sales and property tax account for 50 percent of general fund revenues. Sales tax remains flat for this fiscal year and property tax growth is estimated at 5.5 percent. — The new budget set aside 3.1 percent – more than $2 million—of the General Fund for long-range maintenance of City buildings, roads and sidewalks, lighting and storm drains, parks and landscaping, and equipment and vehicle replacement. — A solid foundation exists for providing quality services while still preparing for the future of San Marcos. Through streamlined processes, new work procedures and better use of technology, we have been able to maintain critical programs and carry out important infrastructure projects. 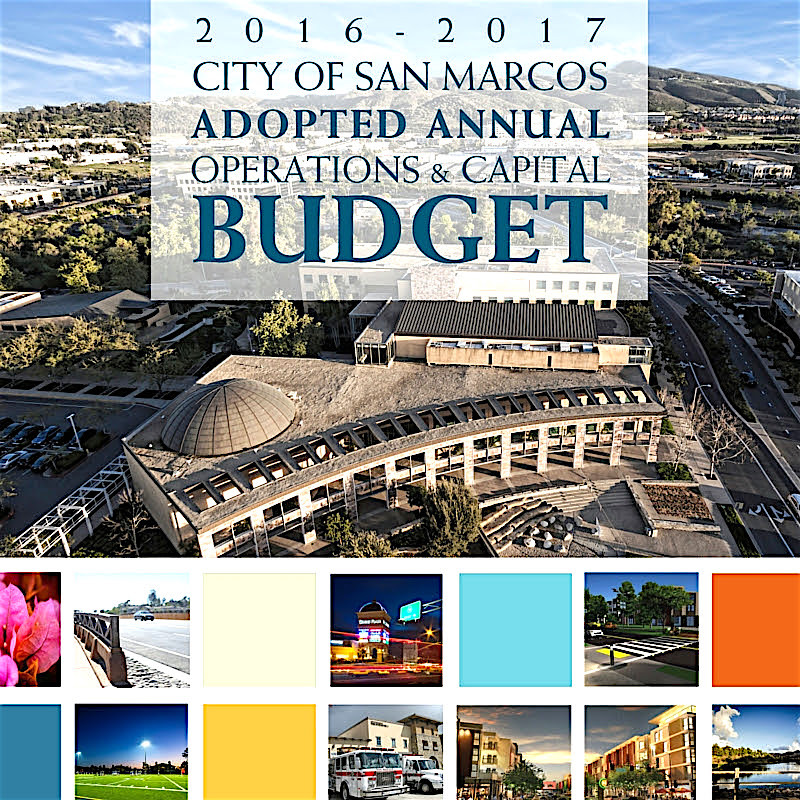 Be the first to comment on "What’s in a San Marcos 2016-17 budget?"